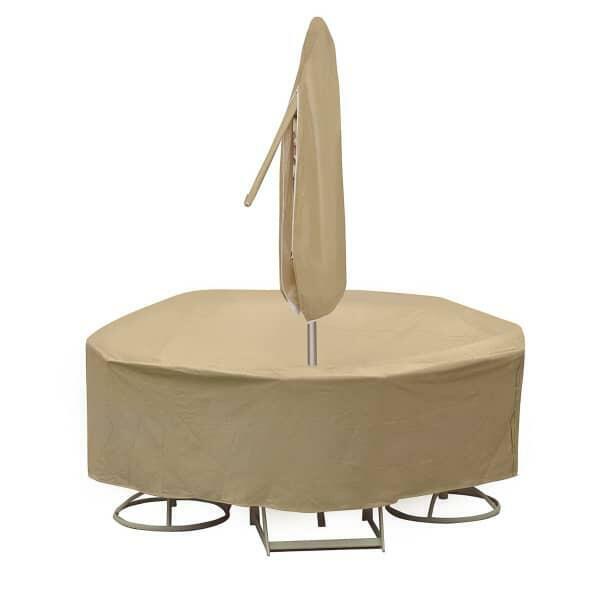 The 48’’ – 54’’ Round Dining Furniture Cover by PCI is meant to cover a round dining table and set of chairs during times of non-use, whether it’s overnight or for a season. This version features a design that allows for easy application and removal, so it is advisable for overnight use by those who cannot stand to see the wear and tear of elemental exposure. The PCI furniture covers each feature their Dura-Gard HD Vinyl cover. The Dura-Gard material combines highly durable and resistant vinyl fronting with an inventive polypropylene backing. The polypropylene is compressed and then laminated to the vinyl fronting. This creates a two-layer durable, safe and protective covering that differs from traditionally fuzzy backed vinyl covers. Fuzzy backed vinyl coverings break down and flake off with time. Not so with the PCI brand. Take your protection to a new height, won’t you?